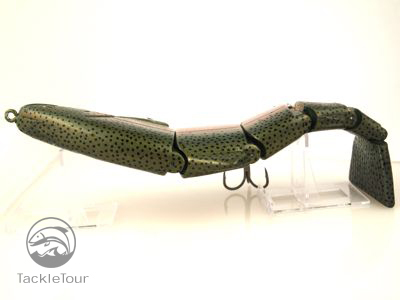 Introduction: News flash: Big, realistic, handmade baits are no longer a West Coast phenomenon. Nate's Baits out of Milwaukee, Wisconsin is set to jump into the big bait scene in a monumental fashion. Crafting and testing his baits from within the unforgiving testing grounds of muskie fishing, Nate Lambrecht's baits have been discovered by the big bait throwers out West, and the wake created by the splash his baits are making in and around the Great Lakes is sure to have a ripple affect throughout the country. Background: It's a well known fact the art of tossing big baits for big fish is not a discovery of the black bass fishing fraternity. Those in pursuit of the great northern fish have been chucking and winding and trolling disproportionately large baits in pursuit of these real giants for decades. The fact many of these techniques are translatable to the pursuit of black bass has been a boon to an already popular industry. Nate's Baits featured concealed joints. Nate started his craft in the same fashion as many other bait builders - trying to save money by making fish catching tools for himself, then for a few friends. Word spread to friends of friends and the next thing Nate knew, he had a list of customers wanting a copy of his creations. The only difference here is Nate's target species were Muskie, not black bass. No matter, once word started to spread about his baits, it didn't take long for the big bait throwers in the bass fishing world to take note and now here we are, on the cusp of serious big bait madness. 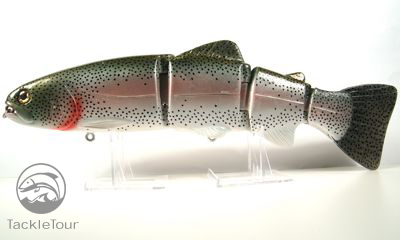 Trout: Nate's Baits signature product is an eleven inch, eight ounce monster of a bait complete with four main body joints and an additional joint at the tail. 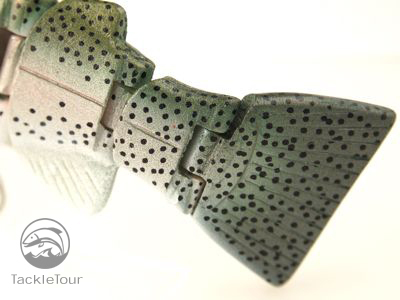 It is a beautifully sculpted bait with very good detail and a nice finish. This is a slow sinking bait and comes standard with Owner hooks. Its extraordinary length is offset by a very thin body in an effort to increase hookups. 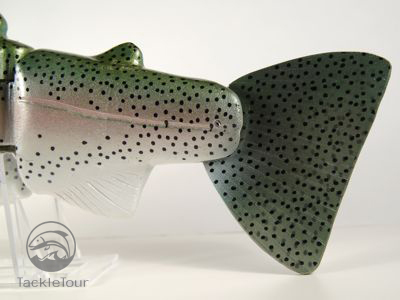 The trout features a custom formed tail from the same material as the main body. Cisco 2: Mention the word "Cisco" near TT Headquarters, and the staff starts looking at their routers and back-end communications equipment. In the mid-west, or more specifically, the Great Lakes region, a Cisco is a herring like fish pursued by larger predators for sustenance. 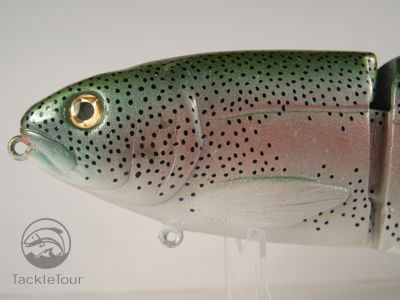 Nate's Baits actually has two versions of this bait, the first, is in a more traditional shape and profile of the native Great Lake's Cisco, but the new version is more akin to that tasty bass morsel, trout. In both versions, it is a two-jointed, three-sectioned bait but this product is still undergoing a makeover in an effort to reduce the number of protruding fins. The Cisco 2 is what we have at TT Headquarters and it is a monster of a bait measuring out at twelve and a half inches and weighing in at thirteen and a half ounces - the original version weighs eighteen ounces. Introducing Nate's second generation Cisco bait. The interesting thing about this and all the other baits in Nate's Baits arsenal, really, is that you can custom order colors and sink rates to suit your needs. Just shoot an email to the manufacturer with your request and they will respond with the feasibility of meeting your request. The former Cisco bait was built to resemble lake herring. 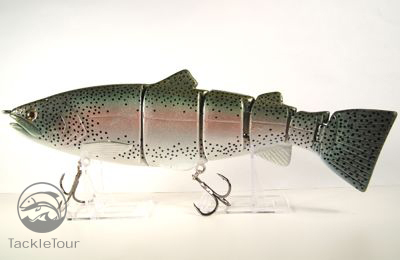 This version, tail and all is built to resemble a trout. Different than the 11" Trout's head, the Cisco is still very realistic. 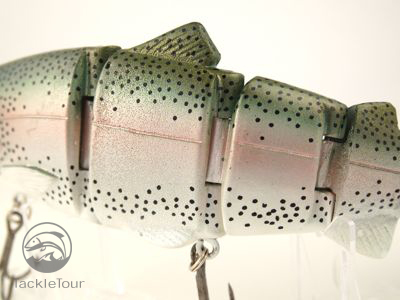 El Grande: As if the Cisco weren't big enough, Nate's Baits has recently introduced the El Grande. This bait his their take on the wake bait phenomenon and measures in at a full fourteen inches, thirteen point eight ounces. It is a monster of a bait and built with the intention of deadsticking behind the boat as a decoy for big, hungry Muskie. Introducing Nate's Baits El Grande wake bait. 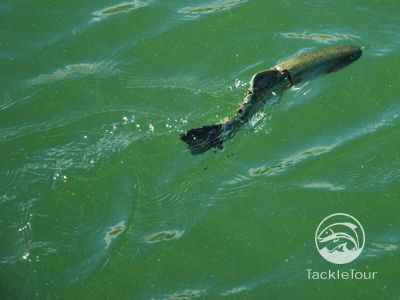 This three sectioned, non-lipped monster has an oversized tail that really kicks out a wake behind as it is slowly crawled along the surface of the water. It's hard to imagine a bass coming up to east this thing, but we can't wait to try it out and take our chances. The wake created by this bait, even in disturbed water, is inspiring. 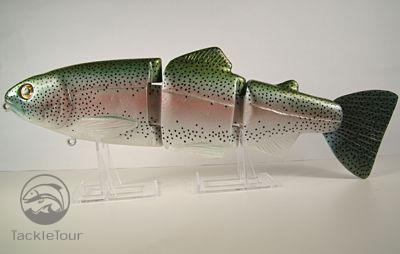 Not only does the 11" Trout have a very thin body, but it has a very good range of motion even with the concealed joints.